I have recently reviewed a few books about (extreme) industrial music and wondered why there is so little information about the German scene in them. To me it seems that German industrial culture has made (and still makes) a big mark on the industrial underground. Well, here we have a book with a title referring to Genocide Organ, so that is a good start. 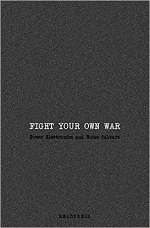 Fight Your Own War: Power Electronics and Noise Culture is a collection of essays from a variety of authors and with a variety of subjects. After a foreword by Mike Dando (Con-Dom) and an introduction by the editor, we set of with The Genesis of power electronics in the UK. This is, of course, a historical view on early British power electronics with anecdotes. This is probably the better known part of the book, but we also get a similar insight in the Finish, Japanese and American scenes. In Japan noise seems to be experienced differently from Europe or America. There are essays more circling around one project or one person, but also one about the ‘zine culture. The second part of the book is more focused on the experience of noise and power electronics. The texts here are about experiencing the music life, the shock tactics that are used, the making of these types of music, the development of the scene, etc. The third part puts the stress on philosophy and ideas, or the lack of them, used many artists. Power electronics as comedy; but also texts more critical towards the scene such as the fiercely feminist text by Sonia Dietrich. Fight Your Own War is informative, not specific to any part of noise music (not excluding noise rock for example) or a period in time (we go from the early days to 2015). There are reviews and reports of live events, but no interviews. The book is styled like a magazine of times past and makes a descent read. It seems to aim at a more academic level in approach. What stroke me as a bit odd, is the use the terms that appear to be established, but I never ran into them before. “HNW” (‘harsch noise walls’) and “ANW” (‘ambient noise walls’) to refer to certain styles of noise also written as “wall noise”. This appears to be a different style from what I calls “walls of noise”. I guess in Gangleri terminology “HNW”, and especially “ANW” would be “noisescapes” since both appear to be hardly changing sound collages. Not every text is as interesting as the next, but it is nice to read how artists are either deliberately ambiguous or not at all, why some artists use the imaginary (on stage, in artwork, etc.) that they use, etc. the thought of the artist or the listener. It also becomes clear that listening to noise is something different from listening to ‘normal music’. Indeed you cannot say that you like noise because of the melodies or because of the interplay of the different instruments. You can even ask yourself if listening to noise is enjoyable. Is it a ‘pleasure received through pain’? Such notions are also dealt with in the book. The book is certainly not an encyclopedia. Many projects are not mentioned and many just in passing. There are a whole lot of names that I never heard before though, nicely mentioned in the index at the end. I do not think that this is ‘the ultimate book about noise’, but it is certainly more varied in approach than other books that I read, so in that regard it may be the best so far if you want to get an idea not just about the music and its history, but also about the artists and the listeners.